Up until my ABEO sandals arrived on my doorstep, my sandal situation was pretty dire. Like I said, I had the other pair for like two years. They were cheap and not very supportive to begin with, so they weren’t really meant to be worn for more than one season. I have back problems that extend down into my legs, plus I’ve never really been good on my feet. I’ve always gotten achy after an hour or two of walking around. I need something supportive and comfortable, but I wanted something CUTE. ABEO sent me two pairs of amazing sandals: one for everyday use and one for fancier outfits. I madly “heart” both of them. 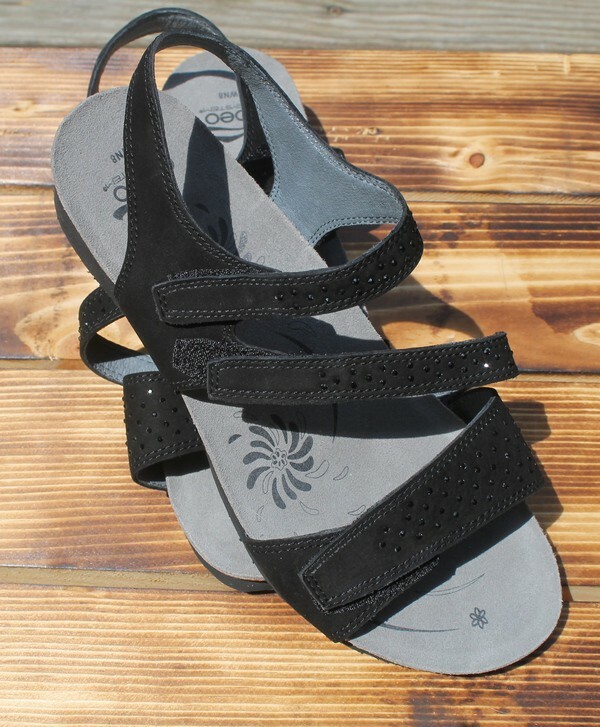 The first pair is my “practical yet stylish” everyday pair: the ABEO B.I.O.system® Eternity sandal. I went with the “sand” color because it goes with pretty much everything. These sandals are incredibly comfortable right out of the box. They’re water-friendly, so you can wear them to the beach or the pool. While I don’t recommend jumping in the ocean while wearing them, they can handle splashes, rain and a little light water without getting all icky. They also dry pretty fast, so you don’t make that weird squishy squeaky noise when you walk. 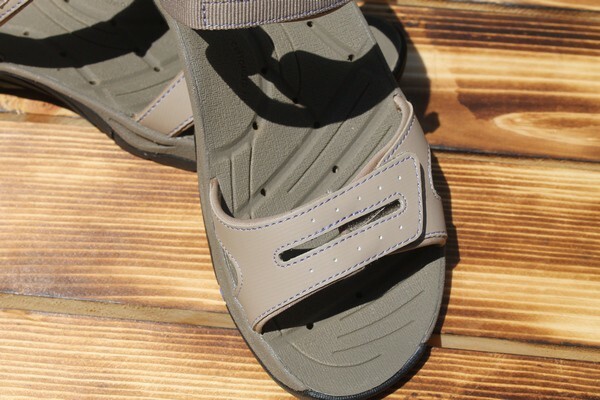 These sandals feature an Aegis® antimicrobial shield, which keeps them from getting stinky or grungy. The straps are adjustable, so you can actually buy your size without worrying that they won’t fit. Inside the shoe is a custom orthotics interior. You can’t see it, but it’s there to keep you comfy as you stroll around all summer long. I also have my super duper adorable Camille sandals. They’re also quite comfy, with their built-in orthotics and lightweight cork midsoles. The cork really makes a huge difference because it provides cushioning without making your feet all hot. The combination of the rubber bottom and the cork helps absorb shock as you walk, so your feet don’t end up crying for mercy. These sandals are comfy enough to wear all day yet dressy enough to wear with a “going out” outfit. While I do prefer the other pair for long days on my feet, I love these for night time. They’re also perfect for transitioning into fall, as I can wear them with black tights and skirts once the weather turns chilly. Both pairs are available either online at ABEO Footwear or in stores at The Walking Company. 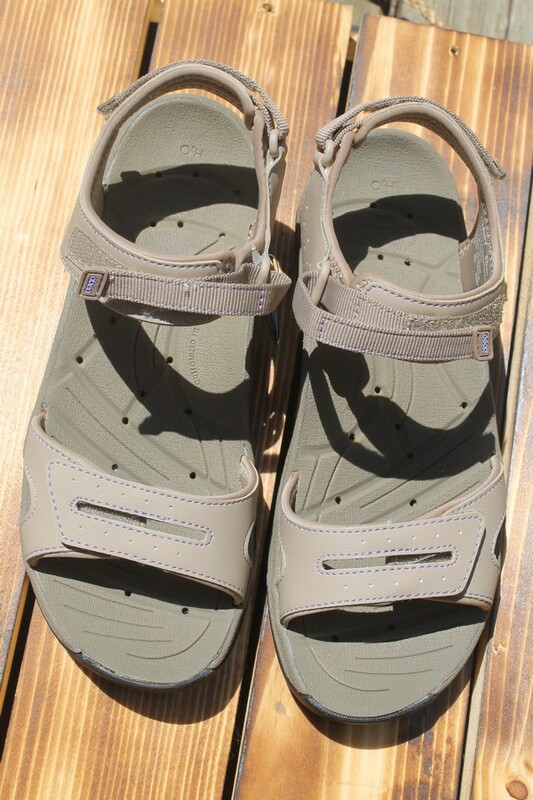 They have dozens of beautiful yet comfortable sandals, from active-wear to classier evening sandals. Check them out and find your favorite comfortable yet cute pair! When was the last time you treated yourself to adorable new shoes? Those sandals look great! I agree with you; they can definitely be a footwear that matches any outfit for outside use (with friends, etc.) Thanks for a great review! Those are super cute. I love how comfortable they look! I think I want a pair, too! It is so hard to find sandals that are stylish and supportive for all of the walking around and playing I do during the summer. 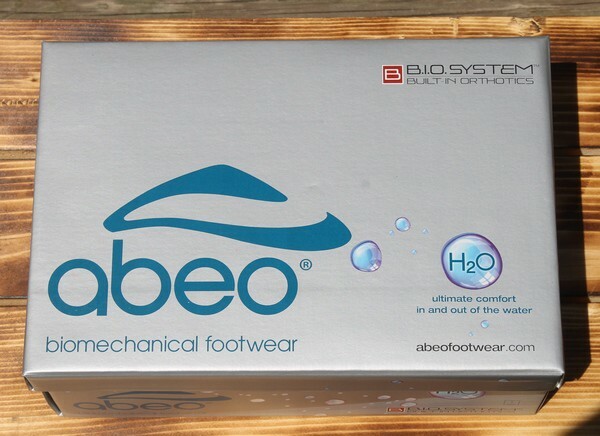 Thanks for introducing me to Abeo footware! I really like the sandals that have the black straps. I hate buying sandals that are “cute” but end up killing my feet! I’m not much of a shoe girl either – I love my flip flops though!! Just living in Chicago does not afford me the luxury of wearing flips flops year round! I usually like high heeled shoes, but do not give as much thought to my sandals. This article contains some nice models and I am curious about the anti-stinky additive (and also very appreciative they came out with this 🙂 ). I’m not much into shoes, but I do have to have comfortable ones. These are both cute. I’m all about comfort and these definitely sound comfortable. It woudl be nice to have some water-friendly sandals for the summer. These are perfect for afternoon walks around the neighborhood or a quick trip to the market or grocery! The sandals look very comfy and I love that it has a soft sole. I would definitely get myself one. Perfect and comfortable for walking the malls or to the market. These sandals look like quality with soft sole only one thing my heels can’t be flat. I have to try. These sandals are pretty! I love the designs and they look comfortable. I will check this out. Thanks for the review. Those sandals really look comfy. Best to use for doing grocery shopping or just walking around the neighborhood with the kids. I will be checking Abeo footware too. Those sandals look really comfortable. I love a good pair of sandals. I would definitely wear these shoes if I had a pair of them. This one seems like really great in terms of style and comfort. Love this footwear! I have super high arches, so finding comfy shoes is a challenge for me. These sandals look like they might be something that would work for me!! When I worked full time outside of the home I had a major shoe problem. Then when I became a stay at home mom, I didn’t wear my heels or flats anymore. Flip flops, sneakers and slippers for me! These sandals you showcase look super comfy but I do love just slipping my feet into my flip flops and not messing with straps. I love the black ones! They look so comfortable! These sandals look so comfy I would love to try these I love wearing them in the summer! These sandals remind me of the ones I have now, and I need a new pair. I never thought to check out Abeo or the Walking Company. I want sandals like these, as I have found they are so much nicer than flats or who knows what I had been wearing before. After I got this last pair of sandals, all my other shoes have been collecting dust. These look wonderful! I love the built-in orthotics on these shoes. I don’t wear high heels anymore. However, it’s nice to have comfort and cuteness in my shoes!